Karl Lagerfeld has run Chanel for the last 24 years, with Lady Amanda Harlech at his side for half of that time in the role of personal and professional muse. 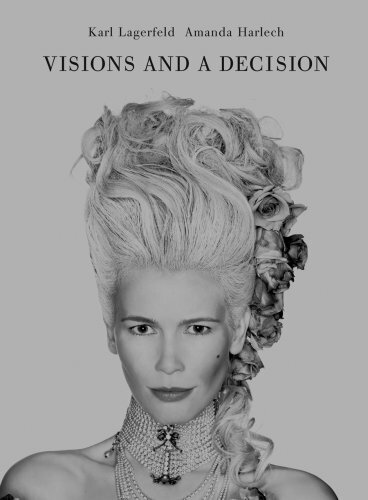 Visions and a Decision, their second collaborative book, combines Lagerfeld’s black-and-white photographs of Claudia Schiffer, Brad Kroenig and Sebastien Jondeau from a 1993 Dom Pérignon Oenothèque advertising campaign with a story by Harlech. Her tale charts the sensual fantasies of a young bachelor, Ghyslain, and Malvina, his bride-to-be; he is charming and ruthless, she is beautiful and demure.“This is a story of a young, handsome, old-money couple,” explains Lagerfeld.“Everything is perfect, they’re just a little bored.”With Dom Pérignon as the catalyst, Ghyslain fantasizes about transforming his prim fiancée into a cast of seductive characters. Harlech’s darkly humorous sensibility, which informs the Chanel aesthetic, is pitch perfect in this story of decadent ennui and passive seduction. Modeled on a traditional fairy-tale book with a title plaque embossed in silver, a black cloth bookmark and silver printing throughout, Visions and a Decision is perhaps not without a playful moral. Suppressing our desires is a dangerous thing; liberating them could be the beginning of a delectable existence.